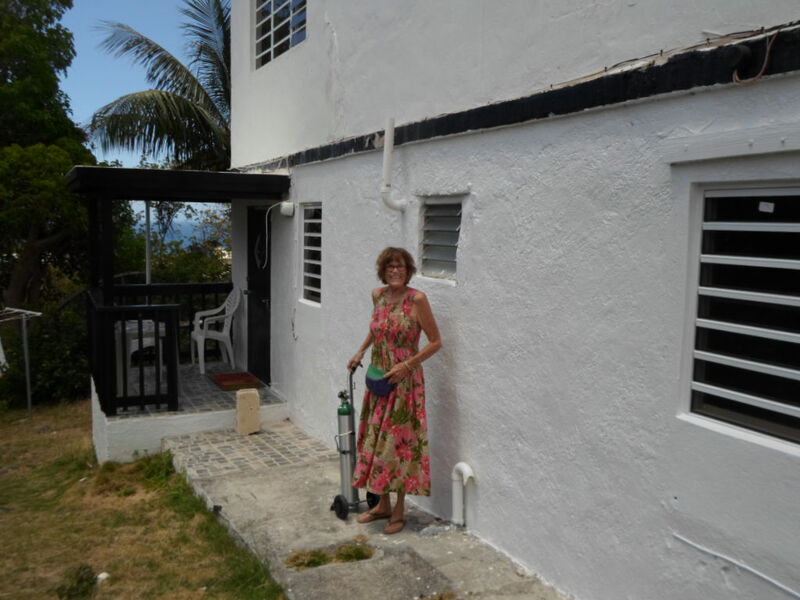 Colleen, my friend of 38 years, had lived in St. Thomas for 25 years and moved to Florida when her health began to fail. Here she is holding onto her round-the-clock oxygen supply. The helmeted guineafowls have been gone a few months. Yesterday, they returned with many chicks in tow, teaching them how to "steal" pellets from warthogs. As annoying as they can be, it was delightful to see their offspring. We've lost a number of friends since we began traveling the world in 2012. Shortly prior to beginning our journey, we lost our dear friend Chip in Minnesota. He happened to be a neighbor, four doors from us but I cannot say he was simply a "neighbor." Both mine and Tom's relationship with this fine, funny, brilliant, retired orthopedic surgeon and his lovely wife Sue far surpassed the equivalency as often applied to a "neighbor," a friend made by convenience and friendliness. Instead, over a period of 26 years Chip became one of the most important people in our lives; a social companion; an intellectual stimulator; a hearty conversationalist rife with myriad fascinating opinions; and a shoulder to lean on during tough times. Here's the link to our story about Chip posted on June 2012, four months before we left Minnesota. Oh, that he would be near us now during this challenging recovery period offering his unsolicited medical advice, emotional support and always, a good belly laugh thrown in for good measure. He and his wife, Sue with whom we've stayed in close touch, remain in our hearts each and every day. I was honored to be asked by the family to speak at his memorial service, a month before we left Minnesota and to this day, I wonder how I managed to get through it with the lump in my throat and tears in my eyes. And, as these travel years have continued, we've continued to lose more friends. I suppose as this generation of ours continue to develop serious age-related illnesses we'll experience more and more of these losses. A few years later, we lost our dear friend Lane who walked into a room to make everyone's heart sing with pure pleasure and adoration. How fortunate we were to have this special man counted amongst our friends over the years. We stay in touch with his wife, Peggy through Facebook, enjoying many delightful comments back and forth. Here's the link to our story about Lane posted on May 2013, seven months after we left Minnesota. Then, we lost dear sister-in-law Lee, married to Tom's blind 90 years old brother Jerome. Lee was his eyes, love, and support for 61 years. We always loved her for her kindness, warmth and devoted attention to Jerome. Here is the link to our post about Lee from December 2013. And then, there was our friend Richard whom we met in Kauai, Hawaii and quickly became a friend to both of us. Richard and his wife Elaine, quickly welcomed us into their busy social life. Richard was considered to be quite the social director. Undoubtedly, in the short period we knew him, he became very important to us both. Here's the link to our post about Richard from February 2016. The list could go on and on of railroad friends, spouses and family members that have passed away over the past six and a half years since we left Minnesota. And then, yesterday I received an email to inform me that my dear friend Colleen with whom I cherished 38 years of friendship, passed away in February in Florida. A kindly friend of Colleen's notified me after she'd recalled how often Colleen mentioned me and how she'd been such an avid reader of our site often sending me email messages as to how much she was enjoying our posts as her health was failing. Her messages always meant so much to me. As an avid traveler, Colleen lived vicariously relived her travel days through of daily posts. For many years, until her illness, COPD, required more medical care, she lived in St. Thomas, the US Virgin Islands. While we were sailing on a Caribbean cruise in April 2013, one of the ports of call was St. Thomas. Of course, I was excited to see her and we selected a strip mall near to pier to meet. We hugged like we'd never hugged before and proceeded to have a fantastic day together. Tom had walked me to the shop where we met and he returned for a quiet day aboard the ship while I stayed with Colleen. She was able to drive at that time and drove me around the beautiful island showing me her favorite spots. We ended at her home of 25 years overlooking the sea and sipped on tea and shared memories of our years together and our time apart. That was the last time I saw her. But, since that time, we stayed in close touch via email. She never failed to write "thank you's" to me for brightening her days as she began to fail. It was only a few months ago, that she sent me the email message, warm, loving and heartfelt. Then, the flurry of my own condition distracted me from writing although I knew as I recovered I'd get in touch with her. I didn't want to whine to her about how I was feeling when she was striving for her next breath. And now, she's gone and already, less than a day after being notified of her passing, I already miss her, regretting I never called her upon returning from the hospital weeks ago. How fortunate I was to be her friend for 38 years. Here is the link from the last time I saw Colleen in April 2013. May she rest in peace and may memories of her always remain fresh in my mind. Death, the veritable mystery, awaits us all in due time. Lately, it has been on my mind, more than ever, as I faced the rigors of this difficult and dangerous surgery and recovery. And, now as I mend, I cherish each day and all the days I am gifted to experience in times to come. We visited Gail and Mark on Sunday to discuss a story we'll be posting later this Friday about the stunning and heartwarming book Gail wrote, "Her Name is Missy," of their time in Liberia during the worst of the Ebola epidemic and her heroic rescue of a chimpanzee named Missy. Please check back on Friday for the story. We loved seeing the birds they feed at their home and holiday lodge located across a small road from the river. The visit prompted us to purchase a bird feeder and seeds. For more photos, please click here.